Officer Russell died on May 3, 1926 and the following text appeared in The Bancroft Times newspaper on May 13, 1926. The photos were provided in 2016 by the officer’s grandson Ted Miller. 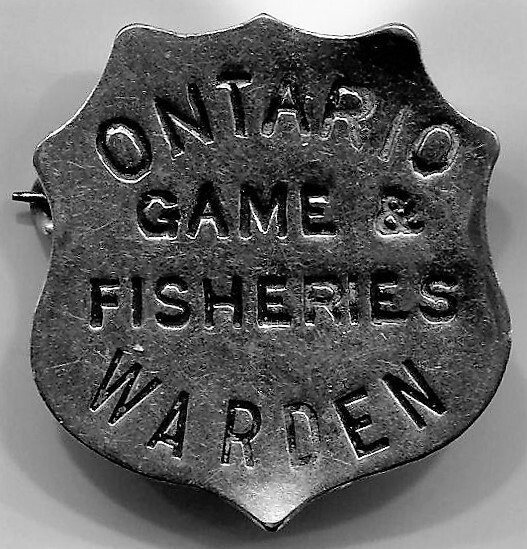 Through the finding of the body of Game Warden S.C. Russell on Sunday afternoon last, the mystery of his sudden disappearance (for a week) was solved but a sorrow and deep sympathy cast over the village and community. Mr. Russell left his home on Monday morning May 3rd, and journeyed to the home of Elijah Vardy. He left there in the afternoon on duties of his office, saying he would return for supper. When he did not return on Tuesday the alarm was given and Provincial Police were notified. Two days search were fruitless but on Sunday over one hundred citizens of the village and neighborhood went to the spot where his foot marks had been last seen around Egan Creek and at two o’clock in the afternoon his canoe and cap were located and shortly after the body. The late Clark Russell was born in Dufferin County, near Dundalk, coming to Bancroft twelve years ago where he made his home and has lived since. He was appointed as a Provincial Officer of the Game and Fisheries Department over two years ago and very faithfully discharged his duties. He leaves a wife and four children, the eldest twelve years of age, his father of Dundalk, three sisters, Mrs. F. Towle of Bancroft, Mrs. Fenwick of Maxwell, and Miss Alma of Toronto, four brothers, Robert, Will and Kelburn of Dundalk, and Jack in Saskatoon. Two brothers and his sister came after his death for the funeral. The deceased was forty years of age and very much respected in the village and by all who knew him. He was an Anglican, a Conservative and an Orangeman. The funeral left his late residence Tuesday afternoon at 2:15 for St. John’s Church for service and thence to the Church Cemetery for interment. Members of the L.O.L. No. 624 and R.B.P. No. 614 attended in a body. The L.O.B.A. also attended in a body paying their last respects to a departed brother. The floral tributes were beautiful and the large numbers who attended to pay their last respects spoke of the respect in which the deceased was held.